JOHNSON CITY — Half a century ago, First United Methodist Church’s living nativity consisted of a few actors in front of painted scenery and the street as a backdrop. They would scramble to their places when they saw a car coming. “It has grown over those 50 years to the sound and light pageant it is now,” said George Barnette, missions chairman of First United Methodist Church of Johnson City. The only thing that hasn’t changed is the living nativity’s purpose: honoring the Savior and strengthening the faith of those who view it as well as those who participate in it. Those actors are church members, playing the roles of Mary, Joseph, Jesus, the wisemen, shepherds, and other biblical figures. 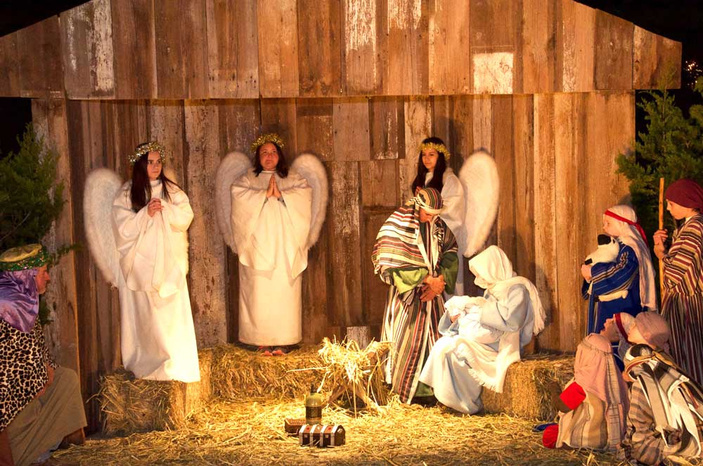 The free, 10-minute viewings of the nativity begin at 6:30 p.m. Friday-Saturday, Dec. 8-9 and 15-16, with the last show at 8:30 p.m. each night at the church’s basketball pavilion, 105 N. LBJ Drive. By moving the event indoors, the crowds have grown, Barnette said. Hot chocolate, coffee, and cookies will be available. In addition, more than 100 nativity sets from around the globe will be displayed. Barnette said the sets are collected and brought back by the church members. It’s common to see at least two, sometimes three, generations of the same family take the stage at the same time. While the people in the show are technically actors, they aren’t memorizing or saying lines; the music is playing, and they are acting out what is being described, Barnette said. The scenes also include live animals, though which kind varies depending on what livestock is available to be used. It’s not unusual to see a donkey, a lamb, or even a llama. Thanks to its history and the timeless lesson, people make it a point to drive hundreds of miles to Johnson City to spend 10 minutes at the church.